Ten teams are gearing up for a fall competition to present avehicle of their own design that can simulate trips between the moon's surfaceand lunar orbit. The 10 teams were announced today by the X Prize Foundation,which is hosting the 2008 NorthropGrumman Lunar Lander Challenge. The contest is planned to take place atHolloman Air Force Base in Alamogordo, N.M., Oct. 24-25, 2008. A $2 million cash prize awaits the team that successfullycomplete twochallenges involving taking off and landing on a simulated lunar surface.The purse is provided by the NASA Centennial Challenges Program, in an effortto encourage commercial research into moon landing technology. The contest isalso funded by the New Mexico Spaceport Authority and the State of New Mexico. The first stage of the competition requires a vehicle totake off from a designated launch area, rocket up to 150 feet (50 meters) in altitude,then hover for 90 seconds before landing precisely on a pad 50 meters away. Theflight must then be repeated in reverse. In order to pass, the entire two-tripjourney must be completed within two and half hours. And Level 2 is even harder. During this stage the rocketmust hover for twice as long in the air before landing precisely on a simulatedlunar surface, packed with craters and boulders to mimic real moon terrain. Thehover time in the Level 2 test was calculated to closely simulate the powerneeded to perform a real lunar mission. Though nine competitors signed up to compete in last year'scompetition, held as part of the X PrizeCup, only one team, ArmadilloAerospace, was prepared to take on the challenge. That vehicle missed passingLevel 1 by seven seconds, and ultimately burstinto flames. This year's cache of competitors is hoping things go betterthis year. The X Prize Foundation also has faith someone will successfullycomplete the mission. "Once again, we have excellent teams prepared tocompete in the Northrop Grumman Lunar Lander Challenge," said Peter H.Diamandis, chairman and CEO of the X Prize Foundation. "We are excited tosee new teams join the competition, and I am confident that we will give awayprize money this year." 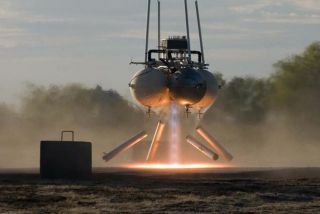 Armadillo Aerospace: Based in Mesquite, Texas, andled by 3D graphics pioneer and video game developer John Carmack, the team wasthe only one to fly a vehicle at the 2006 and 2007 competitions. The group isalso building rocket plane engines for the Rocket Racing League. BonNova: Led by Allen Newcomb and based in Tarzana, Calif.,BonNova was established for the sole purpose of winning the Lunar LanderChallenge. Newcomb designed all of the avionics, flight software, and groundsoftware for SpaceDev's hybrid rocket engine on Burt Rutan's SpaceShipOne, thewinner of the Ansari X Prize. Paragon Labs: The team is led by Kevin Sagis, aveteran of Lockheed Martin, and headquartered in Denver, Colo. The groups,composed of industry professionals from various disciplines, intends to competein Level 1 only. Phoenicia: This group, headquartered in Emeryville,Calif., is led by William Baird. Their Level Two vehicle is called The Wind atDawn. TrueZer0: TrueZer0 is a four person team led by ToddSquires and Scott Zeeb and based in Chicago, Ill. The team consists of amechanical engineer, an electrical/CS engineer, and a father and son who ownand operate a machine shop. The team plans to compete in Level 1 with its vehicle,Ignignokt. Unreasonable Rocket: This group is a father and sonteam located in Solana Beach, Calif., with a long-term goal of showing thatsignificant rocket and space flight capabilities are achievable by small teams.Their vehicles are called Burning Splinter 90 and Burning Splinter 180. Four other teams have requested to remain confidential. The XPrize Foundation will announce their names 60 days before the start of thecompetition.